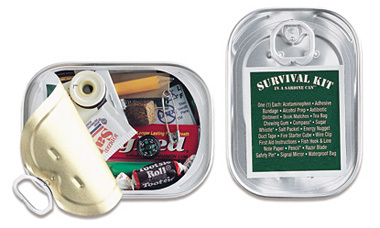 "Survival" Kit In A Sardine Can | OhGizmo! This walks the line between the moderately useful and gimmicky. But as long as there’s no fish smell, I can think of worse ways to spend $10. It’s a “survival kit” packed into a can of sardines. It’s designed for hikers, campers, climbers, boaters, skiers, fishermen, travelers, and cyclists. It’s small, watertight and packs over 25 items with varying degrees of use. Go fish with the hook and line, find your way home with the compass, boil water in the can for your tea and sugar, use the first aid supplies to survive the wilderness. Even duct tape, matches, whistle, signal mirror, razor blade, fire starter cube, chewing gum, salt and a safety pin are included. And the list goes on. So, you know that annoying uncle you’re considering only buying a Christmas card for? Yeah. Well, I’m sure he’d like this better. Do they include a toothpick to get the Tootsie Roll out of your teeth? Do you have to use all the items at once? If you just need a little pencil, and you open the whole thing up, then it’s not longer sealed and water tight.